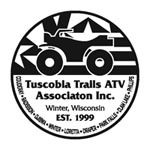 Tuscobia Trails ATV Association is a non-profit organization established in 1999. Our club has over 120 members and is growing strong. Every Labor Day weekend we host an ATV pull featuring the Z-Force Eliminator at Doc Smith Park in Winter. The area boasts numerous ATV trails including Dead Horse Run, Flambeau and The Tuscobia Trail. Come Join the Fun.